Expanding the former Museum of Cartoon Art, a 25,000 sq ft 2-level bookstore and Brazilian-style eatery will be opened within the year. The restaurant is described as a contemporary, internationally-inspired upscale steakhouse. Head downtown to the Delray Beach Tennis Center on Atlantic and Swinton – free admission – and see the beautiful wares of more than 150 crafters, for sale. We all know that some of the best holiday buys are found AFTER the holiday. There will be jewelry, pottery, clothing and other innovative pieces. Fair will be open from 10 am to 5 pm. 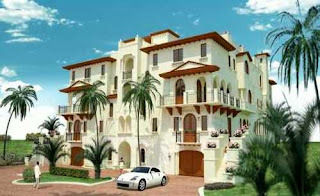 Villas at Highland Beach, #A, with 4 bedrooms, 4 ½ baths, 6678 living sq ft, is listed at $9-MM. From Spanish River Boulevard, go north on A1A to 3511 South Ocean Boulevard. The unit has 3-stories and a private elevator going from garage to roof level. With European styling, this stately penthouse home has dazzling ocean views from the 22’ x 18’ Master Bedroom suite, 25’x18’ Living and 21’ x 19’ Family Rooms and Library. Included are a Gym and Media Room. A 25’ x 14’ chef’s kitchen has an adjoining formal dining room wine room and bar area. Private Roof Terrace, Sundeck and Pool are featured. Membership to the Boca Raton Resort Hotel and Beach Club is included. Gated Entrance with Monitored Security. Completion of construction is slated for early 2008. Marilyn can show you this outstanding property… the most luxurious lifestyle… and other condos are available as well in this complex. The County Commissioners amended the county investment policy so that up to 1% of it’s $1.7BB portfolio can be invested in State of Israel securities, or a maximum of $17MM. Included can be bonds, notes or instruments backed by the full faith and credit of the State of Israel, if rated “A” or higher by Standard and Poor’s and Moody’s ratings services. They must also have a maturity of 2 years or less. The Development Corporation for Israel may act as an authorized broker/dealer for securities backed by the State of Israel only. Backed strongly by Commissioner Burt Aronson, whose Commission District 5 is heavily populated by Jewish families, he pointed out that “Israel has not defaulted on a bond in its 50-year history as a nation." The state of Florida holds at least $230MM in securities issued by the State of Israel and has been an investor for a long time. Governor Charlie Crist and Senator Ted Deutch signed legislation earlier this year called, “Protecting Florida’s Investments Act,” so as not to link public investments with “rogue” nations.